On November 28, 1942, one of the worst nightclub fires in American history took place at the famed Cocoanut Grove in Boston. The most elegant club in the city, started in 1927 and taken over a few years later by wealthy gangsters, was destroyed in less than 15 minutes and the blaze claimed the lives of nearly 500 people – and left an eerie haunting behind. The Cocoanut Grove, named after the famed Cocoanut Grove nightclub in Los Angeles’ Ambassador Hotel, started out as a Boston restaurant turned speakeasy. Musician Mickey Alpert had conceived of an idea for a roaring twenties’-style nightclub for Boston. With hundreds of thousands in financing provided by California mobster and swindler Jack Berman (hiding out in Boston), Mickey turned a vacant building near the Boston Common, located in what is now Bay Village, into a fine eatery with top-notch entertainment. After several owners (all mob-connected), the floor space of the Cocoanut Grove was multiplied several times as adjacent buildings were acquired and added to the Grove’s original footprint. The design of the place was to reflect the tropical setting of Casablanca. The walls were lined with imitation leather and the ceilings were draped with thousands of yards of satin. Six pillars, three on each side of the dance floor, were designed to look like palm trees, with large paper palm fronds extending far out over the floor in a circular pattern. An elevated area called “the terrace” was inside the main dining room just off the foyer. Wrought iron railings had been installed along the edges of the terrace, which created a feeling of separation and maintained prime views of the floorshow for VIPs. The dark basement was created as the Melody Lounge, an intimate area that was so successful that it had to be enlarged twice, finally ending up in an octagon shape that was roughly 35 by 18 feet, in the center of the lounge. This place was to be a bar, pure and simple. No floor show, no dancing and no fancy food. The only entertainment was a singer, playing the piano on a small revolving stage. The basement was also given an exotic feel. There was one soft light in the center of the room, aimed at the floor, and neon lined the underside of the bar. The only other illumination was from the tiny seven and one-half watt lights that twinkled out from the fronds of the imitation palm trees in the corners. The dingy walls were hidden by flimsy paneling and the ceiling was covered with nearly 2,000 square feet of dark blue satin over wooden slats. This was meant to give the customers a feeling of sitting beneath a star-filled night sky. The draped satin extended up the ceiling of the staircase leading from the Melody Lounge to the main floor. As the club was expanded, it was done without any concern about the design. No attention was paid to the original layouts of the different buildings the Grove had consumed; they just kept adding and adding. The result was a confusing maze of coat check rooms, dressing rooms, restrooms, service rooms, kitchens and store rooms connected to each other and the three large public rooms by winding and twisting corridors, and to the basement Melody Lounge by a single narrow stairway. Scant attention was paid to Boston’s fire codes either. Thanks to mob connections in the Building Department, licensing boards and elsewhere, the owners could pretty much do whatever they wanted. By 1942, shortly before it was reduced to ashes, the single-story Cocoanut Grove was an amalgam of six interconnected buildings, fronting on the south by Piedmont Street, on the north by Shawmut Street and Broadway Street on the east. The Grove’s original size had nearly tripled. There were three large public rooms with three bars, a dining room, a dance floor and a stage for the band. During fair weather, the roof above the dance floor could be electrically rolled back, revealing the night sky and allowing patrons to dance under the stars. The basement had been converted into the dark, intimate Melody Lounge. The newest expansion, The New Broadway Lounge, had opened only 11 days before the fire. Saturdays were always packed at the Cocoanut Grove and November 28, 1942 was no exception. Legal occupancy was listed as 460 but on that evening, with extra tables and chairs covering every square foot of floor space, over 1,000 patrons were enjoying a night out at the Grove. Among the merrymakers was Buck Jones, the famed cowboy celebrity, star of more than 200 movies. In town promoting war bonds on a bond tour, he was having dinner with a group of fellow promoters. As a VIP, he was seated with his party on the terrace. In the Melody Lounge, people drifted back and forth between the basement and the dining room or the dance floor or the restrooms, but as the night went on, the lounge filled up with nearly 400 guests. In one corner, a sailor and his date were enjoying the privacy created by the dim lighting. As their passions heated up, or because the young woman grew shy, the sailor reached up and unscrewed the tiny light in the artificial palm tree over their heads. Goody Goodelle had just started playing the piano and singing Bing Crosby’s new hit, “White Christmas,” when head bartender John Bradley looked up and noticed that their corner was now pitch black. Annoyed with the sailor but too busy serving the customers lined up four deep around the bar, Bradley called out to Stanley Tomaszewski, a 16-year-old bar boy, and told him to get the light back on right away. Tomaszewski walked over to the corner and politely explained that it was dangerous having the light out and he had to get it re-lit. Unfortunately, the bulb had fallen completely out and it was far too dark for young Stanley to see the socket inside the tree. Striking a match, he found the socket and got the bulb back on. He blew out the match, dropped it to the floor and stepped on it to make sure it was out. As Tomaszewskiy returned to work, he heard someone shout that there was a fire in the top of the palm tree. John Bradley ran from behind the bar and together, the two young men pulled and batted at the tree attempting to put the fire out. As other employees ran to help by throwing pitchers of water on the tree, the scene became almost comedic and witnesses chuckled at their hapless attempts. As the burning fronds were finally pulled down, Bradley looked up in time to see the satin fabric above the tree start to smoke and then burn. A ball of fire erupted from the corner, feeding on the fabric-covered ceiling, and rapidly spread across the room heading for the open staircase. Don Lauer, a Marine private, jumped onto a chair and tried to use his pocket knife to cut the fabric down to stop the fire from spreading, but he was too late. In mere seconds, the entire ceiling was a sheet of blue and orange flame, dripping fire onto the frantic patrons below. Almost immediately, the crowd panicked as hair and clothing began to burn. The crowd moved toward the only exit they knew -- the narrow staircase -- and the fire did the same. As the fire reached the staircase, it continued on its path, burning away at the fabric ceiling over the stairs. The staircase quickly became jammed, as four hundred people tried to escape the inferno, not knowing that the fire was taking the same route, in search of the fresh oxygen on the main floor. Ruth and Hyman Strogoff were Wednesday and Saturday night regulars at the Melody Lounge. They spotted the “little fire” and deciding not to take their chances, headed toward the stairs. Ruth believed that she and Hyman were among the first to reach the foot of the stairs but by that time, the fire had spread and the crowd began a mass rush behind them. In their frenzy to escape, several people grabbed and pulled at Ruth and Hyman to get past them and Hyman went down. Though Ruth pulled hard on his arm, she was unable to get him up. He was held fast to the floor as screaming men and women trampled on him to get past, or by those who simply collapsed on top of him. Within a matter of seconds, there was a growing tangle of bodies at the bottom of the stairs. As Ruth’s hat and jacket caught fire, she was pushed up the stairs by the moving mass, after which she rolled on the floor to put her own fire out. Knowing there was nothing she could do for her husband and that he was likely already dead, she was forced to leave him behind. Before the night was over, hundreds of others would have to face the same terrible choice of having to leave loved ones behind that they might themselves survive. Gunner’s Mate Matt Lane was farther back in the crowd. When he finally reached the bottom of the stairs, the way was completely blocked with bodies, some dying, some already dead. He jumped onto the railing and used it to pull himself along as he climbed over the others to make his escape. He had come to the Cocoanut Grove with his friend Don Lauer, who had tried to slice the fabric from the ceiling only moments before. He would never see Don alive again. The way to safety wasn’t easy. The frightened patrons had to make their way up a narrow flight of 15 steps, past the locked emergency exit at the top, then make a U-turn to the right and down a 10-foot hallway, then another right turn around an office and coat check room for 28 feet, then another right turn and 12 more feet across the foyer to the revolving door opening onto Piedmont Street. All of this with a fire raging over their heads and thick black smoke filling the air around them. The owners had ordered all the service and emergency exits to which the public had access to be locked while the club was open. This was intended to keep patrons from sneaking out without paying their check. Many terrified, confused people never made it out of the basement Melody Lounge. They were overcome by the thick choking smoke or by the heat resulting from the fire. They weren’t aware that there was an exit door in the back of the lounge, as it was disguised with the same paneling used on the walls. It would have taken them down a hallway, up three steps and to an outside exit. The exit door was partially blocked by a sewer pipe so it only opened about 18 inches. But none of that mattered. No one found the door so no one was able to escape that way. Two of the people who survived inside the Melody Lounge were Daniel Weiss, a bartender, and singer-pianist Goody Goodelle. They dowsed napkins with water and held them to their noses and mouths to breathe through and then lay on the floor until the fire had passed out of the room and up the stairs. They then crawled along the floor and into the kitchen, where they escaped through a barred window. The fire had been mainly limited to the ceiling so when firemen made their way down the steps to recover the bodies, they found much of the furniture was hardly damaged. The fire had moved on in little more than a minute or two. When Melody Lounge customers finally stumbled to the main entrance off the Piedmont Street foyer, only the first few were able to make their way through the revolving door before it was completely clogged by the crush of people behind them. They were unaware that there was a conventional exit door right next to the revolving door. Welansky had installed a coat check room in front of it, with a large wooden coat rack blocking the door from sight. It is questionable however, whether this door would have saved many lives as it swung inward and would have been forced shut by the crush of the crowd. In a strange irony, at 10:15 p.m., while Stanley Tomaszeswky and John Bradley were trying to put out the small fire in the palm tree, the fire department was responding to an alarm for a car fire just three blocks from the Cocoanut Grove. It only took a few minutes to put out that small fire, and a firefighter noticed what he thought was smoke coming from the area of the Grove. As the firefighters headed toward the club to investigate, people started running toward them to report the fire. When they arrived, they found heavy black smoke pouring out of the building and patrons and employees scrambling out into the street. In short order, the fire chief on site ordered a third alarm to be issued, skipping the second alarm as he realized the scale of the disaster. A fourth alarm was issued at 10:24 p.m. and the fifth alarm went out at 11:02 p.m. By this time, the fire was largely extinguished and the departments responding to the fourth and fifth alarms were called for the rescue and recovery efforts. While the fire department was assembling outside, the fire continued to rage through the club. As the fire arrived at the main floor in search of fresh oxygen and fuel, several hundred unsuspecting revelers were just beyond the foyer, not knowing that many of them would be dead within minutes, and the rest would be frantically searching for any way out of the blaze. Just as the fire entered the main public room, the lights went out, tumbling everyone into near total darkness, except for the firelight. The dining area, dance floor, bandstand, and the Caricature Bar were all in the main public room. Customers complained that the tables and chairs had been packed in so tightly that they had to twist and turn and walk sideways just to get through the room to the dance floor. Tables were added along the side walls as well, some blocking emergency exits. Some heard the screams first, commenting that there must be a fight. Then they smelled the smoke. Then they saw the flames blast through the doorways and charge across the room. The fire was feeding off the fabric on the ceilings and walls. With the flames came extreme heat that seared flesh and lungs as people tried to breathe. The fire gave off carbon monoxide and toxins as the air filled with thick, acrid smoke, making it even harder to breath. The flames moved through the room so rapidly that many were overcome with heat or smoke before they even had a chance to leave their chairs. Some bodies were found burned beyond recognition while others were found next to their tables without any signs of injury. Movie star Buck Jones was one such victim. A popular story about Jones circulated after the fire. As the story went, he had escaped the fire but ran back into the building several times, carrying out injured victims until he collapsed on the sidewalk and was rushed to the hospital, where he died a short time later. In reality, Buck Jones was at the club that night having dinner, even though he would have preferred to be resting in his hotel room, nursing a bad head cold. Instead, he found himself sitting at a table on the terrace when the fire advanced across the room. He was rapidly overcome by the heat and smoke and fell to the floor next to his table. Firefighters found him where he had fallen, barely alive. The only accurate part of the story was that he was taken to the hospital where he died. It is well known to firefighters that unless directed otherwise, a panicked crowd will attempt to leave a building the same way they came in. The Cocoanut Grove had only two public entrances -- the revolving door in the main foyer on Piedmont Street and the exit leading from the New Broadway Lounge opening onto Broadway Street. This exit entailed a single, inward-swinging door that led into a small vestibule then to double doors opening onto the street. Most of the patrons had entered the club through the Piedmont entrance with only a single revolving door. These two exits were nearly a full city block apart. Men and women who were able to run did so. They were desperate to find a way out -- any way out. And some of them did get out. All but twenty of the club’s employees survived the fire, largely because they knew where the hidden exits were and where windows would open. Some of the patrons were able to follow employees to safety. The rest were on their own -- lost in the dark. As the Piedmont foyer continued to fill with people, bodies continued to pile up against the revolving door. Eventually, under the extreme pressure, the door mechanism gave way and collapsed outward. Nathan Greer saw the collapse and jumped forward onto the sidewalk. Sadly, a ferocious wall of fire followed him through the opening as a blast of fresh air rushed in from outside, burning up most of the people in or around the opening. A set of emergency doors was located along the Shawmut Street wall behind the terrace. These double doors were covered with wooden slatted doors and were blocked off with tables that were added to accommodate the large crowd. Even so, several people were able to find the doors. Each door was only twenty inches wide and the door on the right was bolted near the top of the frame, where no one could find the bolt in the dark. Joyce Spector witnessed the chaos in the dining room. “The men were the worst. Honest. There were men pushing and shoving to get out.” She was knocked down and started crawling across the floor, lungs burning, eyes stinging, until she felt fresh air on her face. She had found the Shawmut Street exit. As she struggled to get out someone outside pulled her through the door and “threw me across the sidewalk, and grabbed for more people inside. It seemed like an hour I lay there. I couldn’t tell. More people were pulled out and tossed down beside me.” Joyce survived her ordeal but her fiancé, Justin Morgan, did not. Charles and Peggy Disbrow found themselves descending the service stairway to the kitchen where they joined a group of people already there. After searching the kitchen in the dark, they found a small window above a counter that had been boarded up. Knocking the boards away, they saw that a pipe was blocking the opening, except for about eighteen inches. Still, most were able to climb through and into a blind alley behind an apartment building. Margaret Foley, sitting in her living room, was unaware of what was going on only a few feet from her home when a woman burst through her back door, ran through her apartment and out the front door. Stunned, Margaret watched as another person, then another, repeated the performance. She later estimated that at least fifty people had escaped through her home. Don Jeffers, also having made his way to the kitchen, dropped to the floor as the room filled with smoke. Crawling around trying to find a way out, he heard a voice in the darkness. Following the voice, he joined four other people hiding in the walk-in refrigerator. They waited there until the fire department entered the kitchen and escorted them out. Two more exits were located on the main floor but both proved useless. One was a service door located to the left of the stage platform. This door also opened inward but it, too, was locked. The other door was in the New Broadway Lounge, locked and well hidden behind a coat check room. The 250 or so customers enjoying themselves in the New Broadway Lounge remained blissfully unaware of the carnage that was taking place on the other side of the adjoining wall for several minutes. Meanwhile, the fire in the dining room was getting hotter. When it reached the velour-lined passageway into the Broadway Lounge, extreme heat built up a massive amount of pressure that blasted the flames and hot gasses down the short passage and into the lounge like a torch. That room did not contain the large amounts of flammable decorations that the other rooms had, but the pressure, hot gasses, and scorching temperatures created an environment that caused the fire to burn more completely than in any other area of the club. Twenty-five bodies, burned to blackened cinders, were found where they fell. Dozens of bodies were piled against the only unlocked exit in the room. Next to the Broadway Street entrance, two large windows had been replaced by glass block. One man was able to break a small hole through the glass block and attempted to crawl out but became stuck. Firefighters found the man reaching partially through the hole but were unable to get him out. They doused him with water but in the end they had to watch helplessly as the man burned to death. A long wall on the Piedmont Street side of the building contained four large plate glass windows. These windows, if broken out would have provided an excellent escape route for those trapped in the dining room area. Unfortunately, they had been covered with wood panels and no one knew they were there. Experts estimate that if these windows had not been covered, hundreds could have been saved. Firefighters needed to get hoses into the building quickly to save anyone trapped by the fire. Early on, wherever they tried to break through, they were driven back by the extreme heat and thick black smoke. When they were finally able to enter, they went through the area where the revolving door had collapsed. They had to climb over a six-foot-high stack of bodies to get to the dining room area. By the time they were able to enter the foyer, the fire had nearly burned itself out. Less than half an hour after it started, the fire was largely extinguished, inside and out. Rescuers now needed to clear the entrances. They pulled body after body from the stack blocking the doorway, piling them on the sidewalk in the cold November night. Police officer Elmer Brooks remembered rescuers lifting bodies and having arms and legs come off in their hands. Clearing the entrances had been a terrible job in itself, but nothing could have prepared them for the gruesome task that lay ahead. As they moved through the building, they found bodies everywhere. Some were piled up against locked doors, while others were by themselves. Some were horribly burned, while other were unmarked by flames. Some were found where they had been sitting when the fire started while others were in found in the far reaches of the club. Firefighter Winn Robbins saw a dead woman, propped up in one of the Grove’s phone booths, still holding a telephone receiver in her hand. Firefighters, police officers and volunteer military men began removing the bodies, piling them on the sidewalks. Some of the victims were still alive but there wasn’t time to separate the living from the dead (except for badly charred bodies) so they were all loaded into ambulances and trucks and taken to area hospitals. Medical professionals triaged the victims as they arrived, sorting out the dead and determining the level of medical care required by the living. Everyone who died at the Cocoanut Grove, died as a result of the fire, but there were several causes of death. The most straightforward were those who were physically burned. Some died from smoke inhalation or carbon monoxide poisoning and still others died from internal burns - burned lungs and nasal passages from breathing the superheated air. Several bodies showed signs of being crushed by a mass of people pushing in on them, or at the bottom of a pile as people collapsed upon them. Even more disturbing was the number of people who had fallen and were trampled to death by the stampeding crowd. As they went about their work inside with stunned calm, outside it was rapidly becoming chaotic. The temperature was falling and the water on the cobblestones was making the roads icy. Fire hoses froze to the ground as smoldering bodies, living and dead, were doused with frigid water. Family members, friends and bystanders were pressing in on the building, forcing officials to form a human chain to stop people from entering the building to search for loved ones or to satisfy their curiosity. Unfortunately, some of the bodies piled on the sidewalk suffered the further indignity of being stripped of their money and jewelry as they lay dead or dying by ghouls in the crowds. Over the next few hours, nearly 450 fire victims were transported to hospitals. Massachusetts General Hospital received 114 of which 75 were already dead or died soon after. Of the 300 bodies to arrive at Boston City Hospital, 168 were dead on arrival and 36 more died within hours. Some were sent directly to temporary morgues but were found to be alive and transferred to hospitals; a few of those eventually made it home. For several days, newspapers were filled with stories of those who lived and those who died. Eleanor Chiampa, only fifteen years old, was very excited to be there that evening. This was her first visit to the famous Cocoanut Grove and to top it off, she was sitting on the same terrace as movie star Buck Jones! Her big brother, home on leave from the war, had taken her to the Grove along with his wife and another couple. The two men were the only people from their party to survive. Eleanor lived for a few days in the Mass General Hospital before she became the youngest victim of the fire. Married earlier that evening, John O’Neil and his bride, Claudia Nadeau O’Neil, had originally planned to celebrate their wedding at the Latin Quarter, another fashionable Boston nightclub. However, at the last minute, they decided to move the celebration to the Cocoanut Grove. Their marriage had lasted only a few hours as neither of them left the Grove alive. Their bodies were found in the dining room, next to those of their best man and maid of honor. Harold Thomas was in the main dining room and Thomas Sheehan, Jr. was in the New Broadway Lounge when the fire started. As people dashed madly about, each of them was knocked to the floor and were unable to get up as others fell on top of them. This likely saved their lives. They were shielded from the flames and heat by the layers of bodies above, and from the bottom of the piles, they were able to breathe the cleaner air near the floor. Both men walked away from the fire that night with only a few burns. Pvt. Harry T. Fitzgerald of the Army Air Corps, was home on leave from Florida. He had not been home for several months and his three older brothers were anxious to welcome him home and show him a good time. James, John and Wilfred Fitzgerald treated Harry to a night at the Cocoanut Grove. None of the four brothers or their dates survived the night. Their mother, a widow of twenty years, lost her entire family to the fire. A few found interesting ways to save themselves. One young soldier reportedly urinated into a handful of napkins and placed them over his mouth and nose. Another young man found a container of ice cream to bury his burning face in as he searched for an exit. Both men survived the fire without injury to their lungs or throats. A party of ten, members of a family of funeral directors from a nearby town, were enjoying a night out, dining and dancing at the Grove. One of the couples decided not to stay for the second floor show, opting to see a program at a theatre just a few blocks away. When they returned, nearly their entire family had been wiped out. Two young couples were at the Grove to celebrate their wedding anniversaries. Helping them celebrate were 11 of their friends and family, including five brothers and sisters and their spouses. One member of their party had risen to walk to the Caricature Bar when he noticed the fire moving rapidly across the ceiling. He shouted for his group to follow him out of the room, but none of them did. He was the only one from the group of fifteen to survive. The others were found later, still at their table. Coast Guardsman Clifford Johnson, who was at the Grove that night on a blind date, got out safely but went back into the inferno four times looking for his date. He wasn’t aware that she had already gotten out safely. He aided others in their escape until he finally collapsed onto the pavement with third degree burns over fifty percent of his body. No one had ever survived such severe burn injuries but Clifford became a medical miracle. Twenty-one months later, he was discharged from the hospital. In an ironic twist of fate, fourteen years later, back in his home state of Missouri, Clifford was killed when the car he was driving left the road, rolled over and burst into flames. Francis and Grace Gatturna were waiting for the floorshow to begin when they smelled smoke. Francis grabbed Grace by the hand and attempted to pull her from the room. As they tried to make their way out, they became separated. Francis made it to safety but Grace did not. After Francis was dismissed from the hospital, he became very depressed, telling family members that he should have either saved his wife, or died with her. His family became worried and checked him back into the hospital. He seemed to be improving with the help of therapy when on January 9, 1943, he jumped through a closed hospital window to his death. The last Cocoanut Grove victim died in the hospital on May 5, 1943. By the time it was over, the fire had involved 187 firefighters, 26 engine companies, 5 ladder companies, 3 rescue companies, 1 water tower and countless volunteers. The property losses were in the hundreds of thousands. The cost in human suffering was immeasurable. Just twelve hours after the fire was extinguished, Arthur Reilly, Boston’s Fire Commissioner, convened a series of public hearings to determine the cause of the fire and find who was to blame. More than 100 witnesses gave testimony, including several public officials and over 90 survivors. The results of the inquest revealed that club owner Barney Welansky manipulated local politicians to his advantage and cut corners, putting his customers at risk, to save a buck or make a buck. At the same time, the politicians and public officials were busy playing pass the buck. Everyone had a good story that seemed to be designed to leave the teller free of any blame or questionable activities. 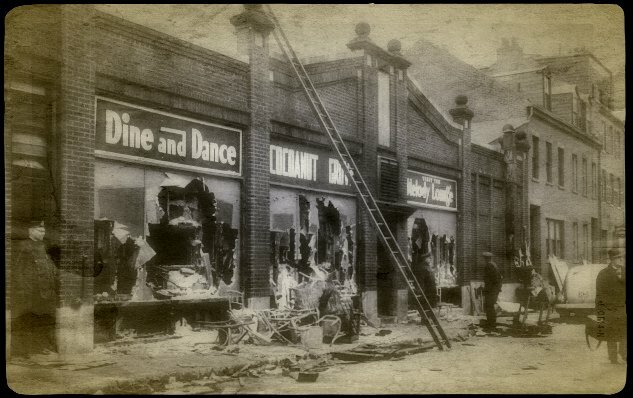 Lieutenant Frank Linney, an inspector for the fire department had inspected the Cocoanut Grove just eight days before the fire. His report gave new meaning to “cursory inspection.” The entire report took only one page. Linney passed every topic and made only two specific notations -- No flammable decorations and a sufficient number of exits. The testimony of the 93 survivors corrected Linney’s erroneous observations. Perhaps the most bizarre testimony was in the form of an opinion offered by James Mooney, commissioner of the Boston Building Department. “I don’t believe a panicked crowd would get out even if there were no exterior walls. They would get entangled among themselves and not get out anyway.” Mooney’s department had allowed the New Broadway Lounge to open without the fusible fire door, no new fire exit, no final inspection and the only emergency exit blocked by a coat check room. The only person who came forward and told the truth as he knew it, regardless of the implications, was 16-year-old Stanley Tomaszewski. He testified to exactly what happened just before the fire started. Tomaszewski had been vilified in the newspapers but he stood tall and told the truth about lighting the match near the paper cocoanut tree in the ill-fated Melody Lounge. He insisted that he had carefully blown out the match and stepped on it. In the end, he admitted that he believed that this was probably how the fire started. Fire Commissioner Reilly did everything he could to ease the strain on Tomaszewski and ease his fright. He praised him and described him as an honorable young man. The Boston Globe advanced the idea that the blame should not be placed on the shoulders of this fine young man, but rather on the heads of the corrupt officials. Even with high praise and reassurances supporting the shy young man, his life was threatened. For the next several months he was kept under protective guard in a Boston hotel. On New Year’s Eve, a Suffolk County Grand Jury handed down 10 indictments, carrying charges from neglect of duty to twenty counts of manslaughter. Barnett “Barney” Welansky and his brother, Jimmy, received the harshest charges. Indictments were distributed to such officials as Frank Linney and James Mooney. Also charged were interior designer Reuben Bodenhorn, and the construction contractor and construction foreman. Stanley Tomaszewski was officially exonerated of all blame. Barney Welansky alone was found guilty on 19 counts of manslaughter and was sentenced to 12 to 15 years in prison. Nearly three years into his sentence, he was diagnosed with lung cancer. Governor Tobin, mayor of Boston at the time of the fire, quietly pardoned Welansky. When he walked out of prison, Barney was a sick, bitter man. While speaking with reporters, he told them “If you were wrongfully convicted, framed, you’d feel you had a perfect right to be free. I only wish I had been at the fire and died with those others.” Welansky got his wish and died just nine weeks after being released from prison. Stanley Tomaszewski died in 1994 at the age of 68. He had gone to college, married, and raised three children and led a responsible life as a federal auditor. No matter what he did or how he lived, he was never able to escape the shadow of the tragedy. He had escaped the fire without injury but was terribly scarred just the same. For decades, he had been called “every bad name in the book” and had received threats and phone calls in the night. Shortly before he died, he said he had suffered enough and wished to finally be left alone. The burned shell of the infamous Cocoanut Grove was finally demolished in September of 1945. Today, the streets that used to box the Cocoanut Grove nightclub have been reconfigured to allow for the construction of the Boston Radisson Hotel and Theater Complex. The Grove’s original footprint has been swallowed up by the much larger hotel along with a tiny parking lot. The only physical reminder of what happened on the site is a small bronze plaque with the Cocoanut Grove’s floor plan. The plaque was prepared as a memorial by the Bay Village Neighborhood Association and embedded in the brick sidewalk next to the parking lot in 1993. Though all other physical reminders of the Cocoanut Grove are now gone, there are other reminders that still linger. Hopefully, most of those who lost their lives have moved on in peace. So many lives were snuffed out before they could know what was happening; bodies were found still sitting where they had been sitting or collapsed where they had been standing when the smoke and fumes found them. It is considered by many that these unfortunate victims are still wandering the site, trying to find their way to safety, or maybe discover a friend or loved one. Several employees of the Boston Radisson Hotel might agree that they are. On a few occasions, people have witnessed strange appearances throughout the hotel. Disheveled and confused men or women, seeming to appear out of nowhere, wander past and disappear just as mysteriously. There have been other experiences reported in the hotel bar and in the kitchen, odd noises, flashes, and loud popping sounds, without any discernible cause. The Stuart Street Playhouse, the Radisson’s theatre, is another location where fire victims make their presence known. On occasion, the quiet, shadowy form of a man can be seen passing a doorway or walking down an empty hall. When approached by employees, he fades away to nothing. Other phenomena include water -- unexplained flooding in different areas within the building and a singular water faucet in a restroom on the second floor that reportedly turns itself on, even when no one is in the room. On one occasion, employees entered the auditorium and found a seat completely soaked, with no explanation. Others have described hearing their names called while working in the theatre at night, with no one else around. It seems that not all of those who stayed behind after the fire remained at the Cocoanut Grove. Another Boston location believed to be haunted by victims of the fire is Jacques Cabaret, just a few blocks away from where the tragedy occurred. Not everyone at Jacques is willing to discuss the ghostly happenings there, but one former bartender said that, “spooky stuff happened there all the time.” The most significant experience he had while working at the bar happened late one night when he was cleaning up after closing. He had left the bar area for a moment and when he returned, he saw bodies lying in long rows all across the floor. He turned to switch on the overhead lights and when he turned back, everything had returned to normal. The night of the fire, as bodies were pulled from the building, some were taken directly to hospitals while others were taken to a temporary morgue or to one of the designated mortuaries. Many who were believed to be still alive and taken to hospitals were already dead, and conversely, some of those taken to the morgue or mortuaries were still alive. A film distribution garage located near the Cocoanut Grove was set up as a temporary morgue on the night of the fire. The bodies were laid out side by side in rows on the tile floor to await identification and transportation. That garage is now known as Jacques Cabaret.